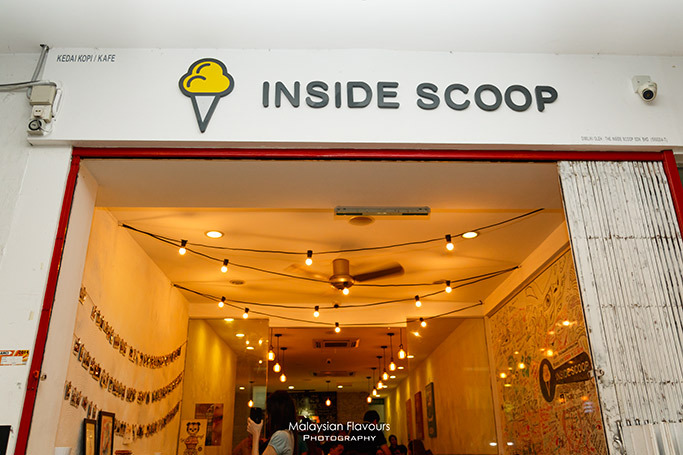 Inside Scoop Ice Cream has been getting positive feedback from many ice cream lovers since their first opening at Bangsar Kuala Lumpur. 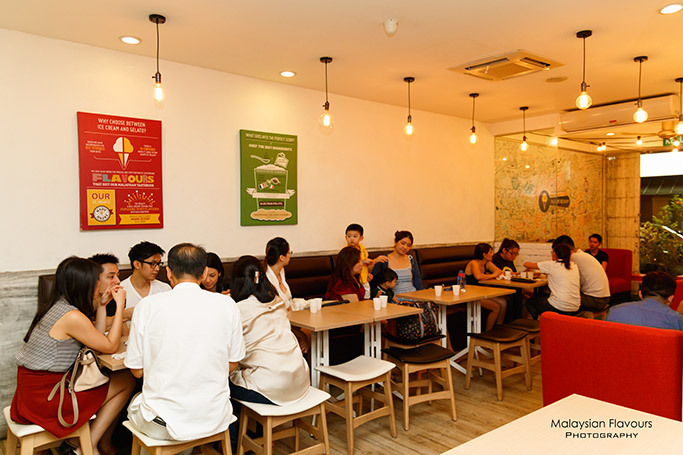 It is located at Jalan Telawi 3, same row with Nosh- the restaurant for one of the best desserts in Bangsar, LA/PA- the new coffee place by TTDI Quartet team, and DipnDip- the heaven for chocolate lovers. 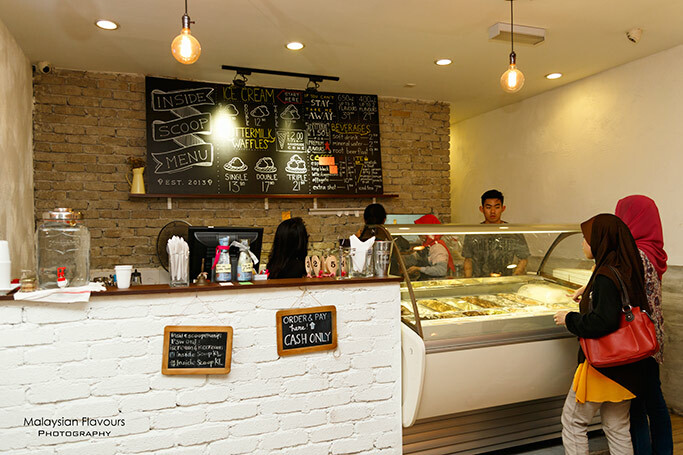 This small, charming ice cream shop expanded swiftly and within a year, they already have three outlets in KL and Klang Valley- namely Inside Scoop Bangsar, Inside Scoop Damansara Jaya and Inside Scoop USJ Taipan. “Come for their ice cream, stay for their waffle.” Many people said so. 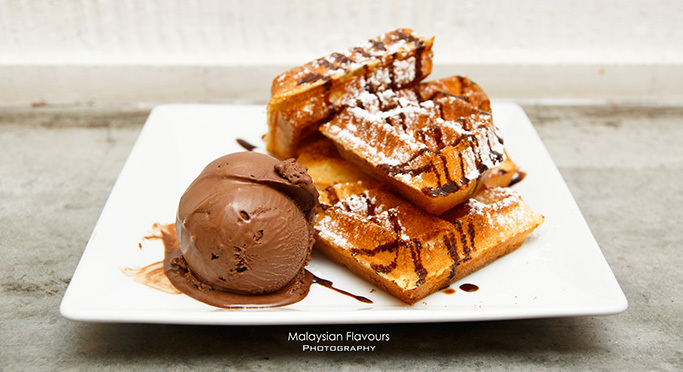 Hence we tried out both during our visit to Inside Scoop Bangsar recently. In fact, these are the only food available on the menu- ice cream, waffle + ice cream, and ice cream + cone. 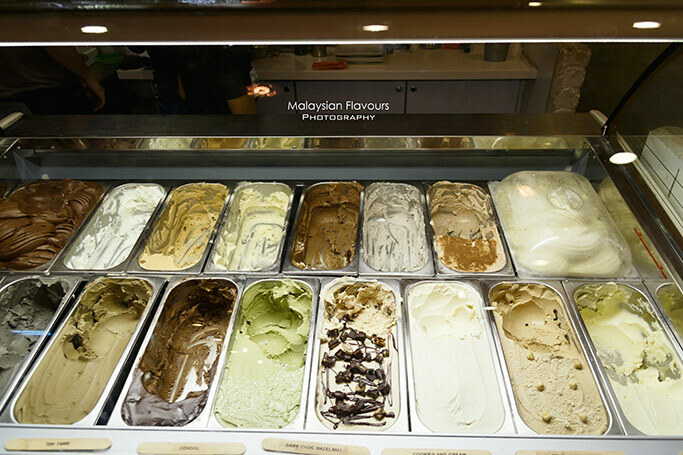 Ice cream is priced at RM7.80 for 1 scoop, RM12.80 for 2 scoops, RM17.80 for 3 scoops. Add RM2 for cone. Inside Scoop offers a wide selection of flavours ranging from premium Valrhona Chocolate, Nutty Nutella, Almond Butterscotch, Peanut Buttercup to local favourite such as Milo Dinasour, Cempedak, Durian, Cendol, Teh Tarik and general flavours like Cookies & Cream, Pistachio, Hazelnut, Dark Chocolate, and Hoji Cha. In case you love Inside Scoop Ice Cream so much and want to bring them home, they are more than happy to offer in pint size. For RM400ml at RM29.90, pick any two flavours. For RM650ml at RM39.90, pack any three flavours into their take away container. 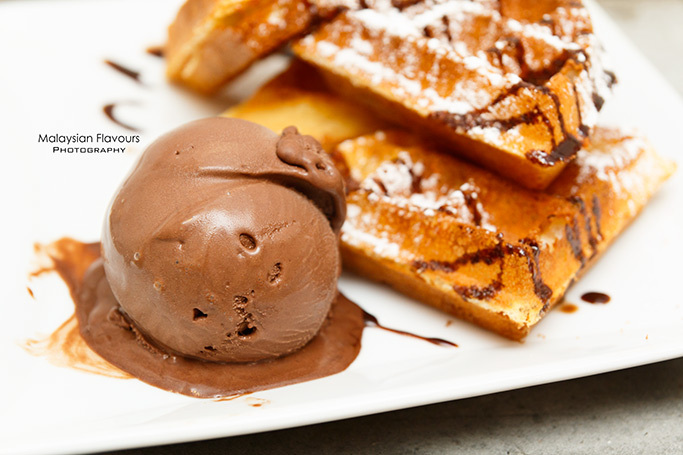 Thumbs up for their ice cream – Deliciously smooth, creamy and dense, intense with chocolaty goodness. Summergirl kept asking for another scoop after finishing her Valrhona Chocolate Ice Cream. 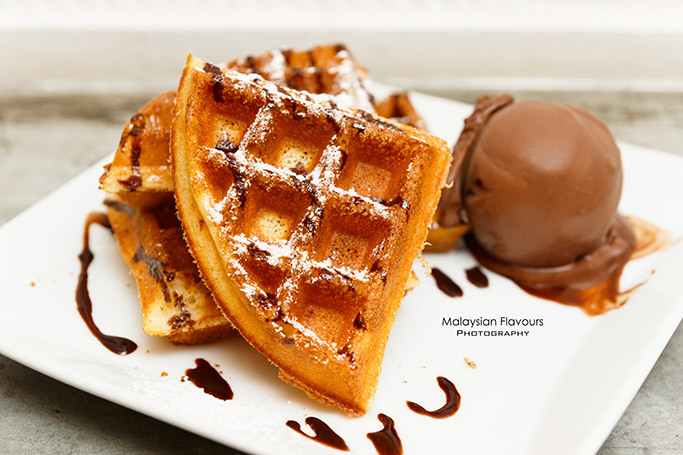 Inside Scoop Buttermilk Waffle is recommended for customers who loves crispy outside, airy inside waffle. But to us, it is a tad too airy that make it close to “empty” in texture. 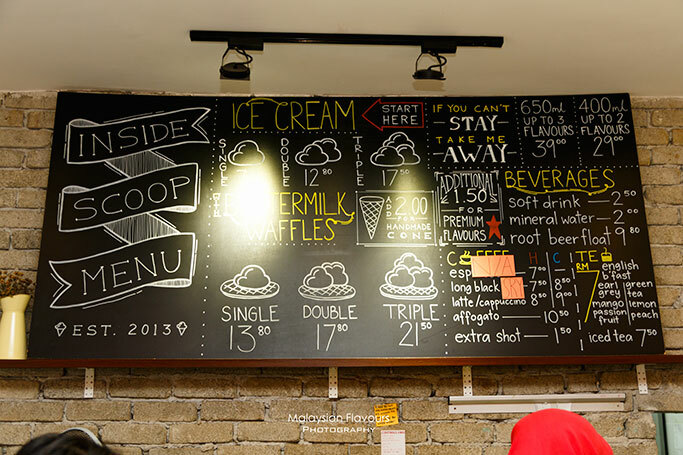 In short, we love Inside Scoop Ice Cream more than their buttermilk waffle. Durian flavour is highly recommended, but we are not a fan of King of the Fruit. Valrhona Chocolate and Teh Tarik is by far our favourite, will check out Milo Dinasour and Horlicks in next visit. 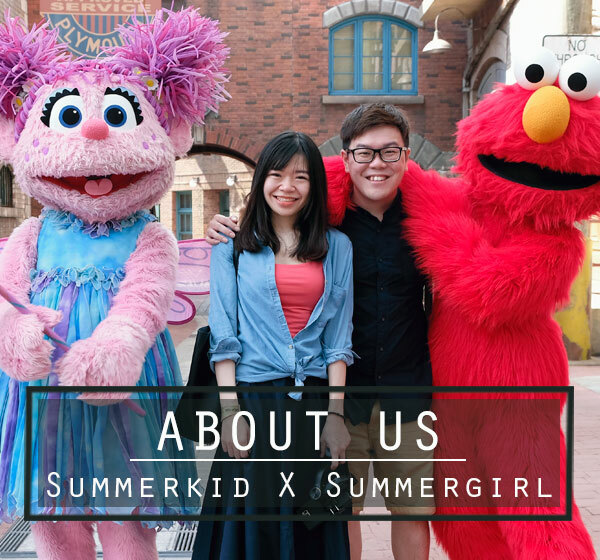 USJ Taipan, Subang Jaya (next to Nandos).